Time Warp celebrates its 25th year in 2019. For over two decades it has been an intrinsic touchstone for the world global landscape, and its influence and reputation has expanded well beyond its iconic festival in Mannheim Germany. Five years after its last touchdown in America, also the last time Ricardo Villalobos played in America, Time Warp returns for its third ever US event, taking over a New York warehouse November 22 & 23 with New York promoters Teksupport. Celebrating its fifth year anniversary in 2019, Teksupport has produced some of New York’s most unique and exciting parties of recent years. They have scouted the city to unearth new locations, throwing parties in submarine factories, navy yards, subterranean ballrooms and industrial warehouses, building a reputation for pairing raw spaces with world-class event production. 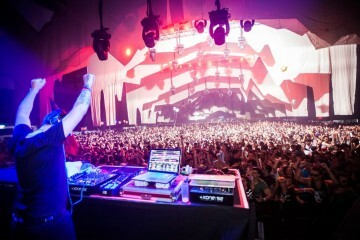 Teksupport also hosted Time Warp’s 20th-anniversary event in New York.